The team of the Multimedia Systems Department published some hundreds of technical papers and participated in more than 20 large research & implementation projects, including European project within 5th and 6th Framework. Graduates of our program are uniquely qualified for a wide variety of positions and can be found in firms and studios in every geographic area of the country. Thanks to the thorough background which our students receive in electronics, telecommunications, acoustics and sound & vision engineering, our department is represented in many important multimedia-related firms and academies and universities, both in Poland and abroad. Moreover, our graduates make carreers as successful freelance engineers, practising managers, equipment designers, system designers, technicians, researchers, recording engineers, sound reinforcement engineers, maintenance engineers and more. 1968 - The Unit of Electroacoustics was established, as part of the Institute of Telecommunications, at the Faculty of Electronics. The idea of establishing the unit was strongly promoted by Marianna Sankiewicz, Associate Professor. 1982 - Gustaw Budzyński, Associate Professor, became the Head of the Unit, at the same time the name of the unit changed to the Unit of Sound Engineering. Associate Professor Gustaw Budzyński ran the Unit for 9 consecutive years, and during that time he devised the syllabus of the first, and for many years the only in the country, specialisation Sound Engineering. 1985 - The Unit of Sound Engineering organised the First Symposium on Sound and Vision Engineering and Mastering, providing the forum for presentation of scientific research in this field. Since then, the Symposium has been organised by different scientific centres in Poland every second year. 1991 - The Faculty of Electronics reorganised. Associate Professor Andrzej Czyżewski became the Head of the Unit. Moreover, thanks to fruitful work of the whole team, the Audio Engineering Society granted its permission to establish the Polish Division . During the first two years of its existence, more than 150 people from the whole country applied for the membership of the Society. 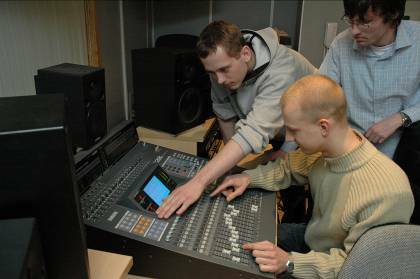 Other Polish universities introduced specialisations in Sound engineering. 1995 - The Faculty of Electronics changed its name to the Faculty of Electronics, Telecommunications and Informatics. 1995 - Associate Professor Marianna Sankiewicz was elected Vice-President of the international Audio Engineering Society. The Unit established Polish Students' Section of the society. 1997 - The Unit of Electroacoustics became an autonomous unit as it transformed into the Department of Sound Engineering. 2000 - As the scope of the Department's scientific research was carried out into new areas, its name changed to the Department of Sound and Vision Engineering. 2003 - Professor Bożena Kostek was elected Vice-President of the international Audio Engineering Society (then re-elected in 2005 and again in 2009). 2003 - The Head of the Department, Professor Andrzej Czyżewski, was appointed to the post of full professor. The Department changed its name to the Multimedia Systems Department. 2008 - Professor Bożena Kostek was appointed to the post of full professor. 2010 - Professor Ewa Hermanowicz was appointed to the post of full professor. 2005-2011 - The Department took part in five European projects 6th and 7th within the EU Framework Programme and in projects under the Innovative Economy Operational Programme (IE OP). The number of people employed in the Department has grown and it currently employs some 40 people. Since 2000, the staff of the Department has been developing their research interests in the field of sound and vision recording and processing techniques, yet treating acoustics as their main area of competence. The department is currently running courses in the area of multimedia technologies in the field of study of Electronics and Telecommunications,. It also runs an engineering specialisation called Multimedia Technologies and a Master's specialisation Sound and Vision Engineering. The graduates of these programmes are provided with an interdisciplinary academic background covering telecommunications, information technology, multimedia, electronics, acoustics and artificial intelligence. Moreover, they are familiar with concepts from the field of psychophysiology of perception and aesthetics. The core of these specialisations is information technology in telecommunications, current issues on object-oriented programming and digital sound and computer graphics issues. Multimedia systems and sound and vision engineering have a wide range of applications in engineering, technology, culture, medicine and education. Thus, the graduates of the above are highly qualified engineers specialising in the design and construction of multimedia systems, digital signal recording and processing, and transmission of sound and vision signal. Due to the broad scope of the educational offer these professions are independent of economic changes on the market. The graduates pursue careers in industries which design, operate and maintain telecommunication networks, in media centres, broadcast production centres, pre-and post production e.g. in technical departments of radio and television stations, in companies dealing with the production of multimedia software, sound or vision equipment, environment monitoring, e-learning, telemedicine, sound technology, special systems design, e.g. in the area of military technology, and many more. Since the doctoral degree programme is growing in popularity, the graduates of Master's courses are well qualified to undertake further research study at doctoral level in the country and European research centres. The research carried out in the field of sound and vision engineering comprises issues concerning the generation of the sound and vision signal in a digital form as well as its recording, transmission, coding and advanced processing. 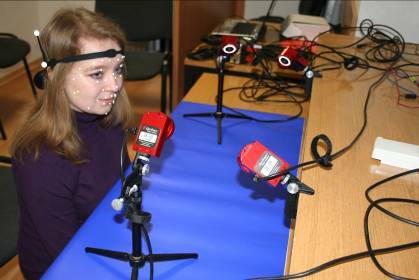 The research team applies novel applications of computational methods of artificial intelligence used to process the sound and vision signal. The team focuses particularly on the area of noise and distortion reduction in archive recordings, as well as in speech transmission taking place in difficult conditions, such as those common in military aviation, or in the process of the restoring sound recordings and archive films, or in image recognition. The result of the team's interests was participation in the Sixth and the Seventh EU Framework Programme, and numerous practical implementations. Other areas of the Department's focus are: psychophysiology of hearing and vision, audiology, phoniatrics, and logopaedics. Electronic and information technology play a significant role in the diagnosis and treatment of hearing impairments. It is connected with audiometric measuring techniques and hearing restoration performed with the use of hearing aids as well as cochlear implants. Telemedical applications designed in cooperation with the Institute of Physiology and Pathology of Hearing in Warsaw were the first interactive tools used in screening of hearing, speech and vision introduced on a large scale. The solutions in this field received numerous awards and nominations for prestigious awards. An acknowledgement of the originality and need for telemedical applications is their gradual introduction into schools within the programmes of both the Ministry of Health and the Ministry of National Education. The applications have been introduced in schools of 370 local governments in Poland. It began in schools of the Mazowieckie Voivodship in 2007, then schools in the eastern regions of Poland (over 3000 schools), followed by schools in the western regions (over 3000 schools). Currently the schools of central Poland are introducing the applications. The International Patent Office published the solutions designed in the Department which served to develop screening tests of hearing, speech, vision and tinnitus. Several thousand devices supporting treatment and designed by the team members have been produced. One of the better known inventions designed in the Department is Digital Speech Correction for stammering. The idea and test results of the device have been presented in numerous publications, such as the Journal of Intelligent Information Systems, and others. The invention received gold medals, among them the Gold Medal at Poznan International Fair. It was also nominated for the Polish President's Economic Prize. The miniaturized device, which fits inside the patient's ear, has been implemented by a Polish electronics company 'Platan' located in Sopot. Due to the growing adverse effects of noise on the human body, it is essential to monitor its level. That is why innovative methods for estimating the effects of excessive noise levels were designed, implemented and verified within the research and development project completed in 2008. The aim of the project was to design a teleinformation system of monitoring the acoustic climate, which shows how noise affects hearing. The devised and implemented teleinformation system comprises monitoring stations installed in urban areas as well as server software to create a noise model, a map of noise hazards and to study and visualise the impact of noise on hearing. New indicators of noise damage estimation, which take into consideration the temporal and spectral nature of noise, were proposed during the study and verified empirically. The results of the study have been published twice in a foreign scientific journal, namely Journal of Noise Control Engineering. The Department developed innovative methods of digital restoration of archive recordings and acoustic echo cancellation algorithm in telecommunication channels, making use of innovative methods of double-talk detection based on watermarking of audio signal. The project of the acronym 'PRESTOSPACE' was carried out under the Sixth EU Framework Programme The results of the research were published several times in Journal of the Audio Engineering and presented at specialist conferences. Projects realized in the Department concerning the participation of Gdansk University of Technology in the structures of Polish Internal Security Platform comprise three national projects and two international ones granted within the Seventh EU Framework Programme. The first of the aforementioned projects carried out in 2007-2010 and entitled Multimedia System Supporting Identification and Fighting Crime (Including Violence in Schools) and Terrorism was an R&D project of the Ministry of Science and Higher Education. The project addressed the issues of advanced technological support which could have a direct impact on improving Police working methods. New technologies of audio-video monitoring developed and integrated within the project can be applied in crime prevention in future. They can also serve as support for operational work, in particular in police investigations, as well as affect the security level of citizens of urban areas. The aforementioned national project served as the basis of a proposal for a European project put forward for a grant in a competition announced by the European Commission in 2007. The subject matter of the competition covered in part the scope of the R&D project carried out at Gdansk University of Technology. This, in turn, enabled the University to receive the grant of a high-budget European project under the Seventh Framework Programme with the acronym INDECT (entitled: Intelligent Information System Supporting Observation, Searching and Detection for Security of Citizens in Urban Environments). The project is coordinated in Poland by the University of Science and Technology (Akademia Górniczo-Hutnicza) and the Department's research team is its main executor. The achievements in the above areas resulted in acquiring two new projects by GUT: one national and one international. The national project MAYDAY EURO 2012 (carried out by CI TASK and supervised by the Rector of GUT, Professor Henryk Krawczyk) is a high-budget structural on-going project carried out under Innovative Economy Operational Programme in 2009-2012. The project name is Mayday Euro 2012 - Supercomputer of Contextual Analysis of Multimedia Stream Data for Identification of Specified Objects or Dangerous Events. It aims at exploiting the potential of modern supercomputer cluster Galera located in the new ETI building of GUT. The Department carries out tasks connected with analysis of images from a system of surveillance cameras and special acoustic sensors distributed in urban areas. In 2010 European Commission took a decision to finance another European project, carried out by the Department. The project ADDPRIV - Automatic Data relevancy Discrimination for a PRIVacy-sensitive video surveillance was highly appraised among all the projects taking part in one of the competitions announced by the European Commission. The project aims to determine which information obtained from a distributed system of surveillance cameras is relevant from the security perspective and thus protects the citizen's privacy right. technological means enabling both sensory feedback and sensory-motor feedback, including smart pen to conduct dexterity exercises which support diagnostics and therapy of dyslexia (the product implemented in 2012). A project under the Innovative Economy Operational Programme is still in progress and further develops the aforementioned grant. The project name Development of Computer Multimodal Interfaces and their Implementation in Education, Medicine, Defence and Industry is an on-going project carried out by the Department, 2008-2013. The project aims to design and implement a series of novel technological solutions based on gesture recognition, computer aroma interface, improving communication senses by means of polisensoric therapy, supporting communication between teacher and hearing-impaired learner, and many others. So far, a pioneering solution has been designed within the project which makes it easier to determine the degree of awareness of people in vegetative states. Among the Department's R&D achievements there are also those in the area of musical informatics, with Professor Bożena Kostek heading the team. Within the scope of its research work, the team devised a number of innovative implementations of intelligent methods to retrieve and process music information, as well as automatic recognition of musical instruments (automatic musical instrument classification), creation of automatic rhythmic accompaniment, recognition of singing voices, and the like. The above mentioned study has been the subject of many research projects and resulted in numerous qualification theses. Professor Ewa Hermanowicz with a group of doctoral students develops advanced methods of digital filters design and complex algorithms in the field of digital signal processing. The Department's team has worked out over five hundred publications and several implementations have been substantiated. 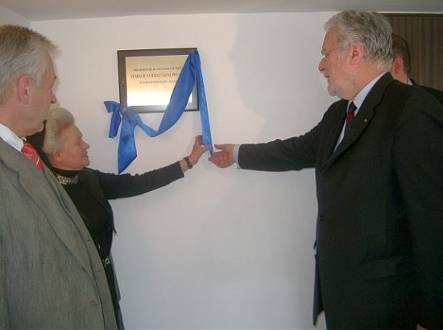 Prof. Janusz Rachoń, Rector of Gdansk University of Technology, Associate Professor Marianna Sankiewicz, and Prof. Maciej Grabski President of the Foundation for Polish Science(FPS), when unveiling the foundation plaque of the new laboratories of the Department which were financed as a reward granted to the Department for winning the FPS competition in 2004. The new laboratories, among them anechoic chamber and seminar room, were a valuable addition to the Department's already existing facilities. 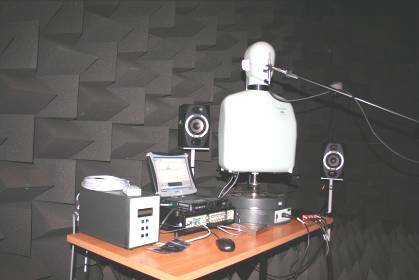 Anechoic chamber with specialist measuring equipment installed. Every student who is admitted to the Faculty of Electronics, Telecommunications and Informatics (Information Science) is required to complete the core curriculum of courses. These courses total 72 credit hours and are taken from the first through the ninth semesters. In addition to the core curriculum, every student must complete the general curriculum courses for the Telecommunications program. These courses total 97 credit hours and are taken from the first through the seventh semesters. After the fifth semester of study, Telecommunications program students are able to choose between several different specializations, with a limited number of students admitted to any one. The Sound and Vision Engineering Department is typically one of the most demanded specializations, and as a result admits approximately 16 of the top students to its program every year. Once admitted, a student may then begin taking Sound and Vision Engineering courses. These courses total 49 credit hours and are taken from the sixth through the ninth semesters. The tenth semester is exclusively reserved for thesis work. Detailed course information is available at the Faculty site. See also the Facutly page for the ERASMUS+ students. The Sound and Vision Engineering Department has established a number of strategic links with various institutions in Poland and around the world. The goal of these links is two-fold: to advance the possibilities for research; and to provide educational possibilities for students in both our curriculum and similar curricula at other institutions.